The fifth book in the dragon series by Stephen Deas, Dragon Queen is certainly value by weight of pages. The previous tale, The Black Mausoleum weighed in at just over three hundred in the mass market paperback, whereas Dragon Queen is twice that and a little more. The first trilogy of Deas’ story is well developed towards its conclusion in Order of the Scales. The fourth book, The Black Mausoleum is a standalone grimdark adventure. Dragon Queen attempts to pick up the loose ends of both and expand the setting as well as continue the story. This is a very difficult task and Deas begins with some backtracking, filling in some of the questions left over from the other stories. What happened to Grandmaster Alchemist Bellepheros when he disappeared back in book one? Well, now you find out. What happened to Queen Zafir after book three? Again, here is the continuation. 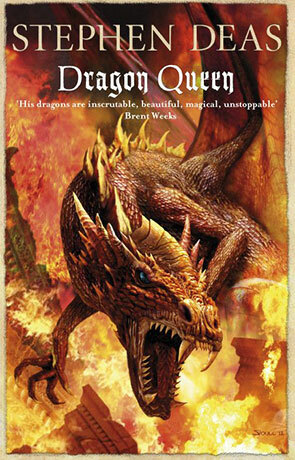 In some ways, Dragon Queen is reminiscent of Magician and the Empire trilogy by Raymond E. Feist. There are some incredible revelations that you may not have seen coming and some of the perspectives introduce us to new cultures. The Taiytakei have been a mysterious ‘across the sea’ people throughout the series and Dragon Queen finally reveals their culture, society and agenda. There’s plenty of new magic, steampunk, Elemental men and of course, more dragons. However, there’s a lot of heavy lifting being done here and a multiplicity of disconnected perspectives. Whilst the chapters are short, the paragraphs are long, full of slow description and exposition, with some unnecessary foreshadowing written into many of the scene endings. Gradually, Deas’ writing becomes less Feist and more Robert Jordan as the pace gets slower and slower. Many sections inch forwards towards the intended goals of Bellepheros and his captors. There is a lack of political cut and thrust from the previous trilogy and as some of the outcomes have already been revealed in The Black Mausoleum, we are waiting for this story to catch up. All of these factors combine to make Dragon Queen a difficult read. The sense of foreboding projected by Bellepheros fits with our experience of dragons from the previous books, but whilst in the Order of the Scales, the circumstances of how this comes about is interesting, we have a lot less investment in the characters in this book. If Queen Zafir had been a more prominent protagonist in the earlier part of the story it might have carried better, but instead we’re mostly with Bellepheros and a variety of new characters from the different locations which are revealed as the story develops. It is with these new characters there is a problem. In The Adamantine Palace, Deas offered a tradesman’s perspective with Kemir and Sollos. In Dragon Queen, this technique is employed with Tuuran and ‘Crazy Mad’. Unfortunately, the gritty grimdark journey of these scarred men is less focused than it might be. Both men have agendas, but these are muddled and confused by what happens to them in their chapters. This means the majority of their adventure diverts us from the scenes we are more interested in. At the halfway point, Zafir does become a more prominent character and the story picks up pace. By now, we have something of the political interconnectedness of the Taiytakei realm to consider, but this could have been developed at a much quicker rate. Once the intrigues of Baros Tsen T’Varr take centre stage, the bite of Deas’ best political writing returns, we are still shackled by some contrivances, but gradually the plot gathers itself towards a clear goal. The final scenes return us to Deas’ requisite dragon fighting. In this case, less dragon versus dragon and more dragon versus magical machines. There is some interesting power balancing to get used to, particularly for readers of the series who might make a comparison to other climactic combats. It is also important for Deas to bring something new to this all action aerial assault and we have that from Zafir, who emerges from this book as a triumphant character, far better realised than she had been in the series before. Dragon Queen is a difficult addition to this series. By amalgamating the grimdark dystopian plotting, the political scheming and the world expansion, Deas has taken on too much in one sitting. A more focused story about Zafir would have made for a stronger volume and the other elements could easily have made a volume in themselves. Written on 6th January 2016 by Allen Stroud.